Facebook is continuing to pick away at its diversity problem, which it shares with most companies in Silicon Valley. 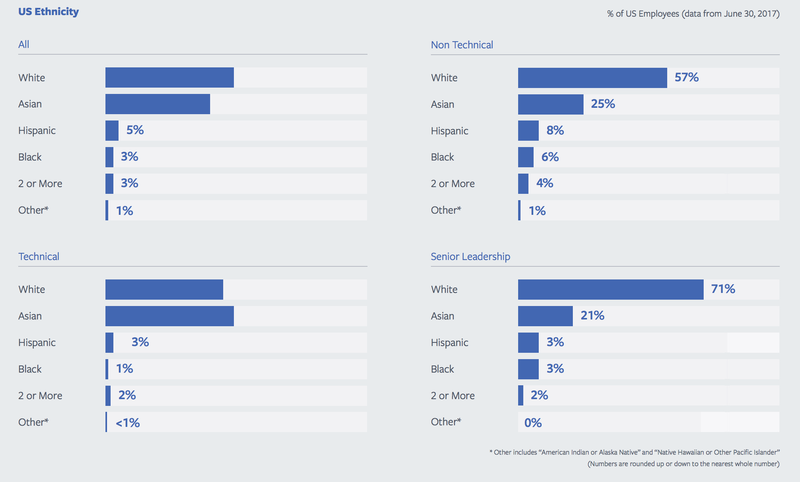 For the first time since 2014, Facebook has increased the overall representation of black employees from 2 percent to 3 percent in the U.S., according to the diversity report Facebook released today. In 2015, Facebook’s representation of black employees actually dropped to one percent but then bounced back up to 2 percent in 2016. This year is also the first time Facebook’s representation of white people has dropped below 50 percent. Today, Facebook is 49 percent white. In the last year, Facebook also increased the representation of Hispanic/Latinx employees from 4 percent to 5 percent. Worldwide, Facebook is 35 percent female compared to 33 percent this time last year. Over the past year, women made up 21 percent of all Facebook’s new technical hires. That helped bump up Facebook’s technical department from 17 percent female last year to 19 percent female this year. Facebook also has slightly more women in leadership roles (28 percent) than last year (27 percent). Last year, of the 61 percent of employees who responded to Facebook’s LGBTQA (lesbian, gay, bisexual, transgender, queer or asexual), 7 percent identified in that way. This year, 67 percent of employees responded, but representation based on self-identification remained at 7 percent. This diversity report comes a few months after Facebook rejected claims of gender bias in its engineering department. Based on an analysis by an engineer at Facebook, it seemed that code written by female engineers at Facebook gets rejected more often than code written by men at the company. At the time of that report, Facebook told TechCrunch the analysis was “incomplete and inaccurate.” Then, in June, Facebook shareholders rejected a proposal for a gender pay equity report. Facebook, along with several other tech companies, has been releasing diversity reports for several years. Since releasing its first report in 2014, Facebook has made some improvements, but Maxine Williams, Facebook’s global head of diversity and inclusion, recognizes there’s more to do. In the last couple of years, Facebook has implemented unconscious bias trainings and, more recently, trainings around managing inclusion and being an ally. These trainings are designed to grow and keep people. With Managing Inclusion, the idea is to teach managers about the issues marginalized and underrepresented people may face. It’s essentially a training session on managing diverse teams. Facebook CTO Mike Schroepfer pushed for and championed the ally training, Williams said. The idea was to do something deliberate to confirm the view that diversity benefits everyone at Facebook, and everything the company does. At this point, 100 percent of all senior leaders and 75 percent of all employees have taken Facebook’s Managing Bias course. The Managing Inclusion and Be an Ally courses are still new, so Facebook’s not quite willing to share that data. Facebook doesn’t make any of these trainings mandatory, because if you mandate something, Williams said, you’re not going to see real change implemented. Moving forward, Williams said Facebook will continue to focus on finding, growing and keeping talent. The company will also continue to release diversity reports.